I made this pie from scratch. Making pies is hard work. 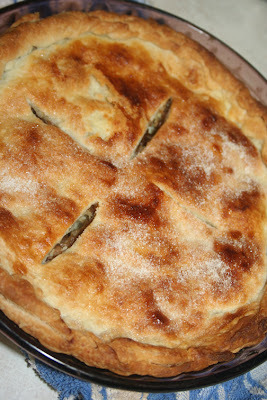 This is an apple pie that was made at the request of one of Rodney's co-workers for her birthday. She wanted something with fruit, not something rich. I was super nervous about sending this thing off to work with Rodney. I'm sure about my cakes but not as confident with pies. I mean, I've made a few in my day but not for large groups of people. Rodney said everyone loved it and there was not a single spec left. I think that's good!